If you see a nuthatch walking down a tree trunk, don't think you had too much to drink. This bird makes it a habit as it searches for insects and insect eggs. Nuthatches are upside-down birds, notable as the only birds that make their way downward as well as upward along bark surfaces in search of eggs and insects. They are easily recognized as they spiral around tree trunks from the top down. They are also known for their habit of stashing food in bark crevices and tufts of moss and hacking them open with their straight, narrow bills. When the European colonists observed this behavior, they called these little birds "nuthack" and the word evolved to nuthatch. Frequent visitors to almost any bird feeder, they can become so tame they will feed from your hand. 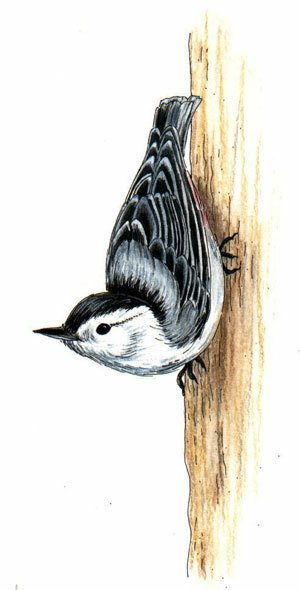 Four types of nuthatches are seen in the 48 states, the white-breasted and the red-breasted being the most widely distributed and most common visitors to residential yards. They travel in small, chattering flocks, often frequenting the same areas as titmice and chickadees, which are closely related to them. White-breasted nuthatches (Sitta carolinensis): Close to 6 inches long with gray backs, black caps and white underparts, they have a rusty tinge on their flanks and short, square tails. Their short black eye stripe is quite obvious. Females are similar but paler, and their caps are gray. While they forage tree bark for most of their food, they frequently visit backyard feeding stations. Their harsh yank, yank, yank call signals their presence in the yard. Red-breasted nuthatches (Sitta canadensis): Slightly smaller than white breasteds at 4½ inches, they are gray-black with black caps, white and black eye lines, rusty underparts and blunt, stubby tails. They prefer the northern parts of the country and Canada, moving southward in severe winters. Some years more are inclined to migrate than other years. Somewhat shy, they frequent groves of conifers, gleaning insects from their outer branches, twigs and cones and visit feeders occasionally.